I believe that the parish council has a key role in the development of the parish over the next dozen years or so. We have met to look at the way ahead and decided that we’d like to propose a few changes to help make it work better. For those changes to be agree at our March Parish meeting the current constitution demands that the proposals be published now before the New Year, today in fact. Since I arrived I have tried not to interfere too much but to observe and reflect on what are the strengths of the parish. I think better with pictures and so I have tried to draw a picture of what I have seen. That’s the basis of the handout that is with your newsletter this weekend. 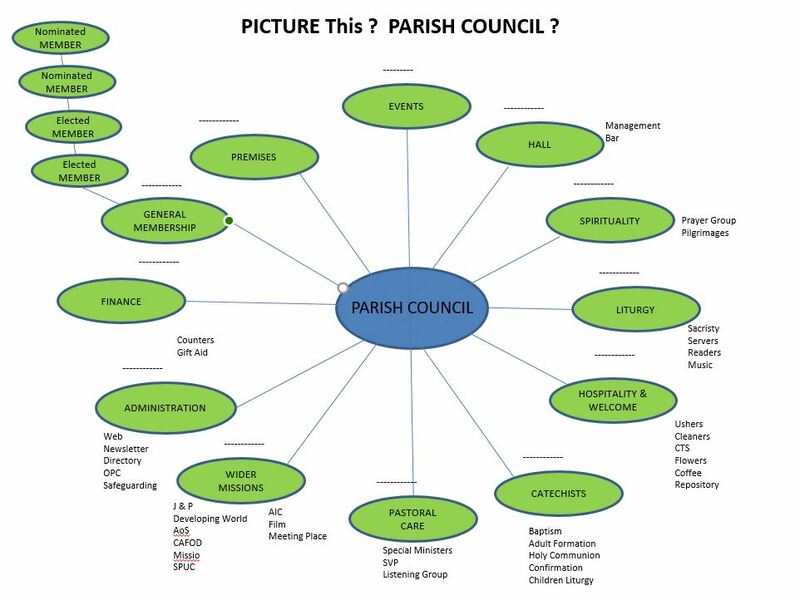 With all the groups or departments or areas that are drawn it didn’t take much imagination to put the Parish Council in the centre of it and suggest that the constitution be amended so that those groups will all have a seat at the table and then be in a good position to coordinate and lead parish activity and deliver the mission that Christ wants us to deliver here in Bexley and beyond. It would be reasonable too to task that group with the discernment and drafting of that mission for consideration by the Parish Meeting of 2020. In the proposals that we in the current parish council are putting forward there is space for two elected and two nominated members but the majority of the council would be constituted by those presently carrying responsibilities or in leadership roles or those who could be put forward by their constituencies. Everyone in the parish could exercise an influence through any of these people or through any who stand for election or are nominated for purposes of balance by the parish priest. I hope that you can see from the picture, where you would be and that most importantly, as far as I am concerned, that you would feel connected in an obvious way. The second piece of the handout is the constitution that would emerge as a result of the change . Please have a look and offer feedback through the current council members or more easily through the contribution or suggestions box at the back of Church. The main thing as far as I am concerned is that we can be together, feel together, work together and enjoy the journey together. God wants everyone to be involved, he has given each and every single one of us gifts that will enable us to do so, and it is really up to us to make sure that it happens. Then we and Bexley parish and others beyond will All be better off. “Love one another as I have loved you”, Jesus says. But he expects us to figure out the best way of doing it. Please help! • To set up sub-committees and liaise with other parish groups as appropriate. The Parish Priest may attend such meetings at his discretion. 3. MEMBERSHIP aims to reflect the composition and needs of the parish. o A quorum will consist of the Parish Priest plus one third of Parish Council members. o At least four weeks’ notice of elections will be given including forms for nomination. nominee’s agreement, and a passport photograph. Parish Meeting with elections being held at the Annual Parish Meeting. Noticeboard in the Church porch and Hall. extraordinary meetings called as needed by the Parish Priest or their delegate. o receive a report on the financial state of the Parish. • Communication Names and photographs of the PC members, agendas and notes of meeting will be published on the Church notice board. A box for parishioners’ comments and concerns will be placed in the Church porch 2 weeks before each PC meeting and the Annual Parish Meeting. 4. OFFICERS The Council will elect a CHAIR to draw up agendas with the Parish Priest and manage meetings; a VICE-CHAIR to deputise and a SECRETARY to circulate meeting information to take and publish notes of meetings. 5. AMENDMENTS TO THE CONSTITUTION Suggestions should be submitted in writing to the Secretary at least 6 weeks in advance of the Annual Parish Meeting and will be published in the parish newsletter.